Search Engine Watch has a great article about RSS Search, but they miss a lot of the smaller RSS search engines! Many people mistakenly refer to RSS search as "blog search." While it's true that many blogs offer RSS feeds (automatic feed creation is a feature of most blogging software), not all blogs have feeds. Furthermore, RSS can literally be used with just about any kind of web-based content. RSS fundamentally is a relatively simple specification that uses XML to organize and format web-based content in a standard way. While blogs arguably make up the majority of RSS content, many news sites also syndicate content via RSS�for example, Search Engine Watch is available via RSS feeds. But RSS feeds are increasingly being used for other types of content. For example, you can get RSS feeds with weather forecasts, company news and financial information, package tracking and lots of others. Even the venerable Yahoo Directory is available now through RSS feeds. FeedForAll Mac, a software tool designed to create, edit and publish RSS feeds and podcasts, has been released by NotePage, Inc. Now, with FeedForAll Mac, webmasters have the ability to create new RSS feeds and podcasts from scratch. Publishers can also modify and enhance existing RSS feeds and podcasts. FeedForAll Mac has a built-in wizard that makes creating and maintaining RSS feeds easy. The software is designed to walk new users through the RSS feed setup process, insuring ease of use and properly formed feeds. Existing RSS feeds that are improperly formatted are automatically repaired by FeedForAll Mac, ensuring that all feeds used with FeedForAll Mac, conform to the RSS specification. The 2005 National Football League season is about to begin and the PubSub team has launched another compilation of pre-built prospective searches (simply add to your aggregator). This time queries are available for every NFL team and for many players. PubSub Football is available here. The current state-of-the art to measuring popularity of blogs is to measure the number of links in/out of from the blog. Link counting doesn't tell the entire story. Mary Hodder will be leading a discussion on developing new measures that would benefit readers, writers, advertisers, PR practitioners and businesses wanting to engage bloggers and RSS content producers. As some of you probably know, Feedburner offers a full range of services to help you build awareness, track circulation, and implement revenue-generating programs in your RSS and ATOM feeds. Leo Laporte decided to stop using Feedburner to serve feeds for all of his projects, including the popular TWIT (This Week In Tech) podcast. Apparently Leo had been experimenting with his Feed burner settings and had inadvertently activated a Feedburner Awareness API. (The API is off by default) It allows the Feedbrner Subscriber numbers for a feed to be available to third party apps, such as sites like Podfeed and PodNova, for publicity and ranking purposes. Leo didn�t fully realize this and was irritated when Rick Klau from Feedburner publicly announced TWIT�s Feedburner subscriber numbers in an Interview with Information Weekly. Eventually fences were mended but the end result is that Feedburner has lost a pretty high profile customer in a very public way and lots of folks have weighed in on one side or the other. BlogPulse Profile has implemented some very cool graphs that represent trends. The rank trend is determined by the number of times the blog/feed is cited by other bloggers over time. Rank is determined as a moving average over 30 days. Feedcombine is a script that will combine multiple RSS feeds into one. You can set up as many combined feeds as you want, either using the predefined links or by entering your own favourites. Technorati and Newsweek are working together to provide readers excerpts of what bloggers are saying about Newsweek articles as well as the most popular articles as determined by blog links. Ready to buy advertisements in RSS feeds but don�t know where to find the feeds that will deliver the strong results you desire? Orange Feed claims to be the solution. Additionally OrangeFeed for Publishers serves content relevant advertisements to your Website�s RSS feeds. Orange Feed is taking on Pheedo a long time player in the RSS Ad arena. The US Open is now offering RSS feeds and will soon be podcasting events. Asharq Al-Awsat a pan-Arab daily newspaper, has RSS feeds available. What is Wrong With a Single Standard or a Single Name???? Not surprisingly, some ardent Atom supporters did not like the article I wrote about RSS Winning the War . The article was not intended to offend anyone, I don't dispute that Atom's format might be a superior specification, but that point is irrelevant if its not widely used. At this point, it appears that RSS seems to have more clout behind it. I stand behind the fact that a single standard and a single name to describe the standard, will go a long way to further consumer adoption, understanding and even further the availability of syndication tools. We don't need RSS 3.0, we don't need web feeds, we don't need web clips - we need a single standard, with a single purpose and a single name. Let RSS become the defacto standard without needlessly complicating it. I know that I'm going to see some resistance to this article, as there are a number of people who feel the Atom specification is superior to RSS, but in years past the same could be said of the Apple Operating Systems to IBMs yet DOS and Windows still prevail. RSS appears to have conquered the last hurtle in becoming the industry syndication standard. Microsoft's inclusion of RSS into the newest version of Internet Explorer and reports that RSS will be in Longhorn's coming release appears to be the final nail in the coffin of the Atom specification. A 'Beta' release of NotePage's new FeedForDev has been released. FeedForDev is a component that allows developers to integrate RSS directly into their applications, opening a channel of communication with their users. FeedForDev is currently in beta. This means that the product is stable, but does not yet contain all the features planned for the final release. Nor does it contain all the documentation. The purpose of the beta release is to solicit feedback from users about the way the product works, and to obtain feedback concerning the features that are included, or should be included in a final release. The FeedForDev component is available in two forms: FeedForDev, a VCL component for Delphi, and FeedForDevX, an ActiveX component for most other development languages. Registration Required for RSS, What is the Point? Publishers want to maximize their RSS advertising revenue and users want full-content feeds. Registration-required feeds may help them meet in the middle. MoonWatcher posted - "I'm building this service now, and am looking for a group of feed publishers to help me beta test it. The requirements are simple: you must have an active feed (at least 50 subscribers, please) that you're willing to put behind a registration-required front end and you must have enough time and interest to give me some meaningful feedback during the trial period, which will last three weeks." Personally I don't get it. What is the point? The quality of the feed's content would have to be something I really want, for me to register. Importers.com a leading global business/trade portal, today announced the launch of RSS feeds for import/export professionals. With this new program, international buyers and sellers can now receive targeted, industry specific RSS feeds of Importers.com business inquiries in real time. 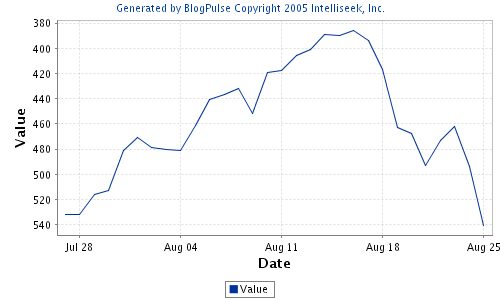 "Mark Cuban�self-dubbed "blog maverick" and owner of both the Weblog search engine IceRocket and the Dallas Mavericks�has warned that those who use Google's free Blogger service under the Blogspot domain may soon be kicked out of IceRocket's search engine due to the insufferable amounts of blog spam the free service produces." Glad to see someone address this issue head on! Robin Good raises some excellent points for conservative RSS publishers, who wish to protect their content and perhaps even profit from it. Forbes Says RSS is Hot; I think its on Fire! "What's the hottest brand on the Web these days? The orange RSS icon." "Take a look at the online sites of any major media company. You will see hundreds of these icons offering RSS, or Really Simple Syndication, which is a way to get information sent to you, such as articles, classified ads (say from Craigslist.com), hotel schedules or even audio files (or podcasts)." MedReader is a RSS Reader and RSS Directory specifically built for the Medical & Healthcare Professional. This RSS reader resides on your desktop and persistently searches for the most relevant information catering to your specialty. I've seen targeted RSS directories like: Finance Investing and Security Protection but not wrapped with a customized RSS reader, interesting approach! Why do big companies need to rename things? What is wrong with RSS? RSS is XML, XML is not necessarily RSS. and possibly but not always XML feed, data feed, content feeds. Its a standard it needs continuity not rebranding! The Copyright Debate & RSS - RSS is commonly defined as really simple syndication. So, this means that any material contained in a feed is available for syndication, right? Well no, not exactly. Do Marketers Really Need RSS? - The recent Forrester Research study, which claims that only 2% of online households in North America use RSS, took the internet marketing world by storm. Does this data really mean that marketers can still afford to ignore this channel? The Future of RSS is Not Blogs - Blogs vaulted RSS into the limelight but are unlikely to be the force that sustains RSS as a communication medium. The biggest opportunities for RSS are not in the blogosphere but as a corporate communication channel. RSS vs Email - Although RSS and blogs are slowly reaching mainstream, they are still missuderstood by most marketers in relation to eachother and in relation to their relatives, e-zines and e-mail. How do these four really relate and what does this mean for your internet marketing strategy? Promote Your Blog - Well, you've joined the others and have created a blog. It is time to tell the world about your online journal. Most blog services generate an RSS feed. When it comes to technology awards, we are usually treated to long-winded treatises by self-appointed experts who don't really know a bit from a byte, and who worship anything shiny and new. What we don't get is a rundown of the best tech from all the grunts out there who use computers day-to-day. Blogtastic is a new blogging directory accepting blog submissions. All blogs are manually approved and must be in English in order to be included in the directory. Finding Blog is blog directory, featuring free submission and claims fast approval. Bulletize is blog directory, its unclear however if you submit the url of the blog or the RSS feed of the blog. For blogs, make sure the information is unique. The same goes for RSS feeds. �As search marketers, we need to write our search content so the feed is meaningful, and the content is meaningful. Otherwise, somebody will just spin through it,� said Amanda Watlington, with Searching for Profit. Marketers need to write title tags for RSS feeds much more clearly, she said. Bill Flitter of Pheedo article on CNET makes a valid point and issues a warning to marketers and publishers. Smart publishers need to wake up and smell the RSS coffee because it's not just a flavor-of-the-day trend for bloggers. RSS is a permanent and fundamental change in the way content is delivered and experienced online. If they don't watch out, their Web sites just might die along with the traditional viewership model. Welcome to the age of consumer-controlled media. Add online blogger to the list of media ventures on the resume of real-estate mogul and reality TV star Donald Trump. Trump's eponymous blog, which is subtitled "ideas and opinions from Donald Trump and his circle of experts," is connected to Trump University, an online education Web site begun in late May. RSS Click Through Rates Staggering! A recent article on WebProNews illustrated the staggering rates that publishers are seeing with regards to click through on RSS feed items. With a 6.43 CTR, it's 500% better than email and it's a proven traffic and sales generator. You don't get caught by spam filters. Anyone marketer or publisher reading the above comment is clearly missing the boat if they have not integrated RSS into their marketing plans. 2. To the left of the results there is text that says RSS | Atom , if you click RSS you will get the RSS feed for that keyword search. Simply add it to your reader. You can now monitor Google News based on specific keywords or ego searches. Learn about RSS Newsmastering from Robin Good. I have been using the existing network in order to collect, organize, and redistribute information. In a certain sense, what I have been building is the equivalent of an airport hub or freeway interchange, a place where many strands of the network come together, are reorganized, and redistributed. Turn your RSS feeds into a search engine friendly html web page using RSS2HTML.php. The new rss2html.php script helps webmasters syndicate content contained in RSS feeds. Using rss2html.php webmasters can customize the format and look of the web page created from the RSS feed. The RSS feed's contents can easily be integrated into an existing website's theme. The rss2html.php script parses the RSS file, extracts the pertinent information, formats it, and serves it up as regular HTML. The new version of rss2html.php has new options to allow it to run on secure web servers. It can be run on any webserver that can run PHP scripts, and it support feeds in the RSS 2.0, 1.0, .93, .92, .91, and .90 format. The new version optionally uses curl rather than fopen, to address any security concerns that webmasters might have. According to Tim Yang's blog Feedburner�s summary burner. Basically the summary burner �strips hyperlinks, truncates content, adds teaser message to each feed item�. For those who build feed in order to syndicate their content are likely not going to be happy to have hyperlinks stripped. I don' t know that this "feature" is going to be embraced. Consider signing up to beta FeedForDev, a new tool for Software developers that allow authors to actively communicate with their users, from within their software, using RSS! A beta release is imminent sign-up to receive notification. One Blog Created Every Second! In its latest State of the Blogosphere report, it said the number of blogs it was tracking now stood at more than 14.2m blogs, up from 7.8m in March. It suggests, on average, the number of blogs is doubling every five months. The following are good places to submit your RSS feeds. RSS Network - simply select the appropriate category (feeds are usually added within 24-48 hours) keyword stuffed spam feeds are rejected. Finance Investing - strictly for finance and investment related RSS feeds all others will be rejected. Security Protection - strictly for security and protection related feeds, any other topics will be rejected. Other resources for submitting RSS feeds can be found on RSS Specifications. Very cool online tool to convert RSS feeds to PDF documents. While the tool is very cool I'm still trying to determine what the practical use is. Drop me a note if you have any ideas! Google's Blogger site, has been hacked. The hackers have demonstrated their skills by defacing and granting admin priveleges to all members of blogger on Google's own "Blogger Dev Network Blog" according to Dirson today. RSS feed creation tool for webmasters and content providers! Automate your rss submission. Automatically submit your feeds! RSS to html script to display RSS on a website. Record and edit audio files with software. copyright 2004-2019 NotePage, Inc. all rights reserved.